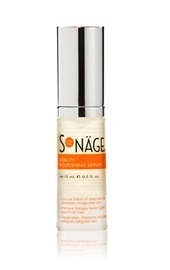 Sonage 15 ml 3000R Facial Serums - Specific Treatment Vitality Nourishing Facial Oil. Luscious botanical serum helps fight superficial lines and wrinkles. Vitamin A improves skin texture, firmness and smoothness, Gingko Biloba extract increases blood circulation and Rosemary oil promotes skin soothing.